The U.S. Patent & Trademark Office recently published a patent application from Samsung revealing their work on a new ‘smart ring’ accessory device. It shows a gesture-based smart ring to fit alongside the South Korean tech giant’s growing wearables product range. The patent filing reveals that the ring may have the ability to control other devices, such as smartphones and TVs. It also shows a contextual menu where users can control devices and services from their finger. The ring may also have a rotating bezel, similar to the Gear S2, for accessing menu options. Given the current state of smartwatches, which are still only slowly catching on, it is a little unclear just how necessary (and useful) smart rings will really be. But the actual prototype is some ways off yet, so I suppose they have time to figure it out. 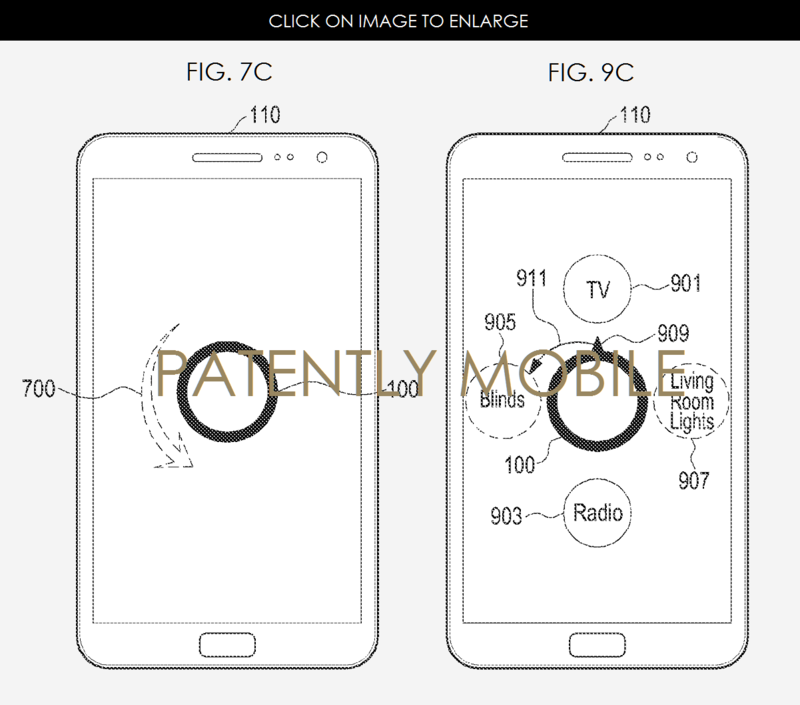 As revealed in the patent (FIG 7C), the ring may be placed on another electronic (such as a smartphone or TV) in order to display the first screen data. Although FIG. 7C illustrates an example in which the wearable device rotates in a counterclockwise direction, the portable terminal may recognize clockwise rotation and perform a set operation corresponding to the rotation. It further reveals in FIG. 9C that the smartphone is able to recognize the ring and instantly display a menu that includes icons corresponding to the functions set in the recognized ring and icons corresponding to at least one of the functions that are settable by the ring. This may include a TV icon and a radio icon. Samsung also claims that they’re working to have their smart ring work with social media sites like Facebook to control functionality in a unique way, a major difference from the smart rings Apple and Microsoft filed a patent for. A smart ring might become more valuable as we enter a more connected world. When there are potentially hundreds of different smart products, having a hub on your finger might be an elegant and simple solution. As this is still a patent application, it is still not known whether or not it will be realized and the time-frame in which it may be released to the public, but it is still a hopeful technology. Hopefully, if they do develop it, the tech giant is a bit more successful than some kickstarters we’ve seen.